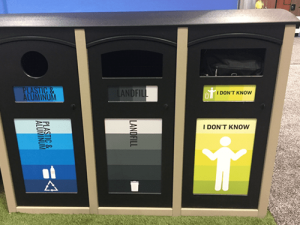 At the Greenbuild Expo, CleanRiver Recycling Solutions displayed some of the recycling bins they manufacture from 97% recycled plastic. For three November days in Chicago, the Greenbuild 2018 International Conference and Expo focused on sustainable construction materials, best practices, and design. Innovative products included a device that, when attached to a trash can, senses the item about to be disposed, and in some cases recommends the option to recycle. Another exhibited item provided an “I Don’t Know” option as one of three trash cans. That strategy could reduce contamination of recyclables. The ecoPreserve delegates to the 2018 Greenbuild were Sustainability Specialists Sarah Hamoui and Rains Vickery. This year, the event will be at Atlanta, Georgia’s World Congress Center on November 20 — 22, 2019. Air pollution is taking 139 days from your life. Want them back?